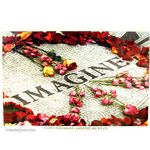 Picture of New York's Central Park stone memorial to Beatles legend John Lennon. Approx. size 24" x 36".